According to The Lifesaving Society drowning is the second leading cause of unintentional death for children under five years old. The best way to avoid drowning is to practice better water safety. When infants or toddlers are in or around water never leave a child unattended. If you will be absent even for a moment designate a replacement “lifeguard.” Always supervise children and avoid distractions of any kind. This means putting your phone down and no multi-tasking. “If you’re not with arm’s reach, you’ve gone too far,” the Lifesaving Society emphasizes. Bathtub drownings also occur every year among young children. Don’t leave young kids in the tub unsupervised. Enrol Kids in Swimming Lessons/ Camp. 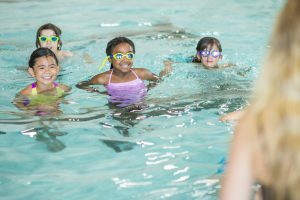 Basic swimming ability is vital for your kids. Take that a step further and make sure everyone in the family can swim well too. You can start introducing your babies to water when they are about six months old. Enrol in parent and tot aquatic programs. Educate your Kids about Water Safety. Teach kids to swim only in areas designated for swimming. Whether in the backyard or in a lake they need to be aware swimming in open water is not the same as swimming in a pool. Establish Family Swimming Rules and Enforce Them. For example, encourage kids to ask for permission to go near water. This will get them into the habit of swimming only when an adult is present. Another example is to enforce the rule to always swim with a buddy to encourage your child to not go swimming without supervision. It’s good to have young children and inexperienced swimmers wear swimming aids such as water rings, float suits, armbands. However, these aids should not be used in place of lifejackets or be used to replace active supervision! Make sure they cannot get to water without you! Every municipality has different bylaws for pools and fencing make sure you secure private pools with appropriate barriers to restrict and control access to water. Keep pool toys that can attract young kids to a pool out of sight when not in use. Drowning is fast and silent. Learning CPR will teach you how to prevent and respond to emergencies. If you own a pool have appropriate equipment such as reaching or throwing equipment, a cell phone to call 911, life jackets and a first aid kit close to the pool.